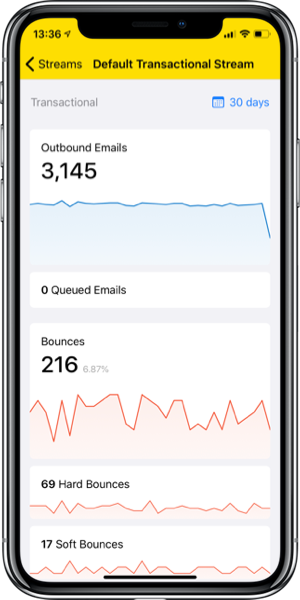 Monitor your application email from anywhere. 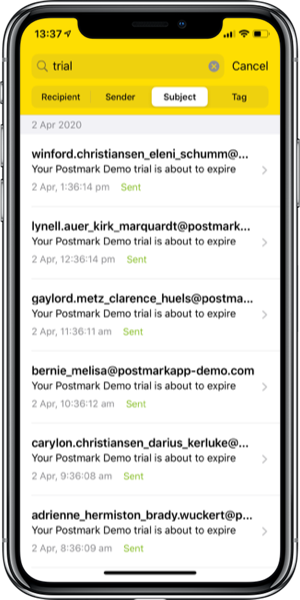 Take Postmark’s powerful monitoring and troubleshooting tools with you everywhere you go with our iOS app. Available for iPhone and iPad devices running iOS 11 or later. 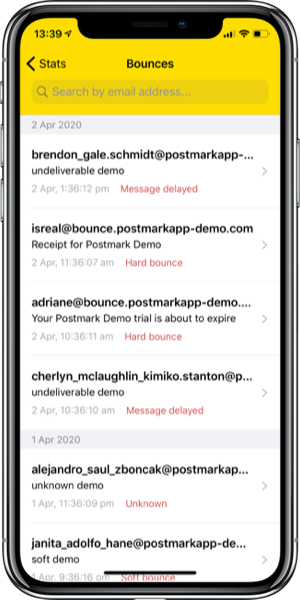 Quickly access stats for all of your Postmark servers to keep an eye on your sending volume and bounce metrics. This app is a great addition to an already essential service that allows our team immediate access to all the information necessary for thorough customer support. 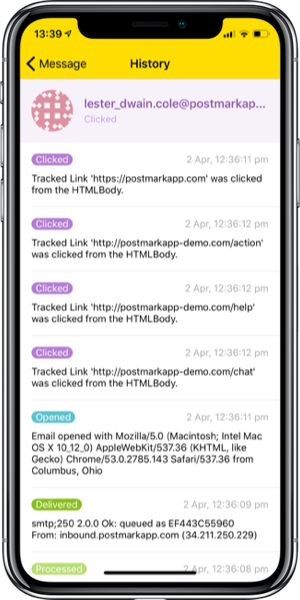 Effortlessly track down a specific message by recipient, sender, subject, or tag. View message details and content previews. 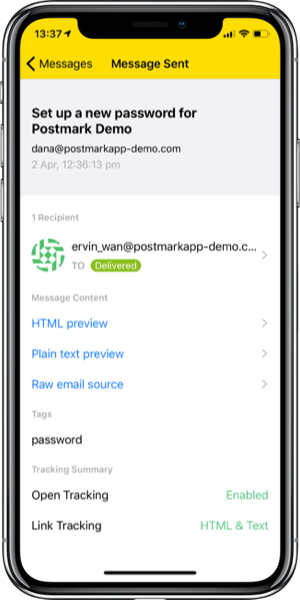 Find out exactly what happened to every message you’ve sent with detailed message data and content previews. Find out when an email was delivered, if it’s been opened, and whether the recipient clicked any links. View a timeline of bounced emails and search for emails that bounced for a specific recipient. 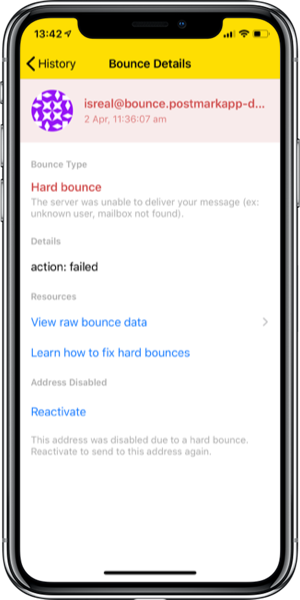 Find out why an email bounced so you can fix the problem quickly. Once it’s sorted, reactivate the address to start sending to it again. Touch ID and Face ID. 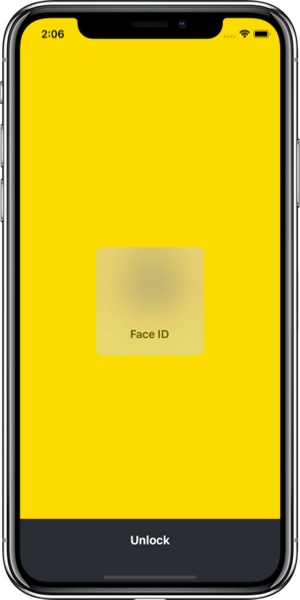 Enable Touch ID or Face ID to ensure that the only person with access to your sensitive Postmark data is you. All your account credentials are securely stored in the iOS keychain. A Postmark account with owner or admin permissions is required to use the app.